The Myanmar Mahar Dana Company called a meeting to discuss with Htilon villagers their plans to build an antimony processing plant near Htilon village, Hlaingbwe Township, in Karen State. 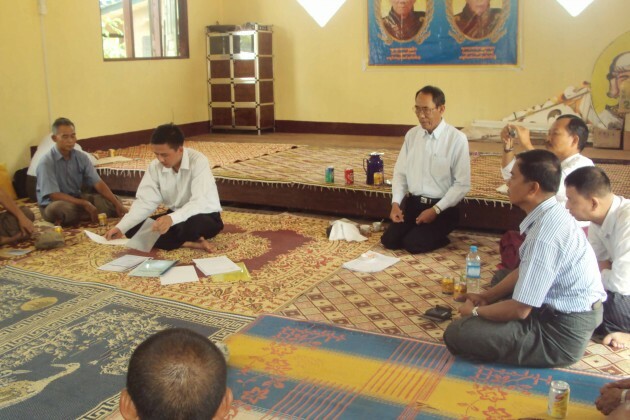 Mahar Dana chairman U Tin Soe told villagers at the meeting in Htilon village on March 24, that he wanted to build a processing plant with the agreement of the villagers and would try to set up the factory without harm to the environment. U Tin Soe said at the meeting that the factory would be implemented without affecting local business, it would create job-opportunities for local people and a school, clinic, roads and a electricity source would be built. State Minister, Saw Min Aung Lin, a member of the Phalon-Sawaw Democratic Party, met with the Myanmar Mahar Dana Company chairman on behalf of the villagers. The Minister got involved after villagers requested he get assurances from the company that processing plant would not have hazardous side-affects. Speaking to Karen News, Minister Saw Min Aung Lin said. “As I’m a representative of the villagers, I am here to listen to the villagers’ views. If the villagers do not permit, the factory cannot be built. I want to have an agreed legal contract between the company and the villagers so as not to affect local businesses. Myanmar Mahar Dana Company is a joint venture company between Thai and Japan businesses that have applied for a 40-acre land concession from the State government.